There are three finished objects to show today! I’ll get off that Shame Train, yet. I knit this in the round, carrying the yarn not in use up the side. This has 7 stitch steeks at the neck and armholes, which I reinforced with crochet (see Eunny Jang’s article) before cutting. Edgings were picked up and knit as usual. For the v-neck edging, I decreased with a K2tog, ssk at the center point every other row. It looks nice, eh? This yarn’s fantastic. It’s nice and dense-feeling and woolly, but it’s pretty light, so you get a lot of warmth without feeling like you’ve got this big heavy thing on. You can’t get much better than these colors, either. Mark loves these, they look good on him, so I keep knitting them. And finally, leg warmers for me! Yarn: my handspun Spunky Eclectic Fiber Club May 2008 selection, “Rosebud” Corriedale wool, 250 yards of 14 wpi/sport, plus some extra bit of another handspun yarn for the top ribbing, because I ran out of Rosebud. Needles: 4? I’ve already forgotten. They’re 15.5” tall, 11” around the top, and 9” around the bottom. My calves are 15” around at the widest point and ankles are 8”. These are fitted and stay up well, but aren’t too tight, even with 4” negative ease at the widest point. These are knit just like a sleeve. Cast on and rib a bit, and then start increasing 2 sts. per increase row with the increase rows spaced about an inch apart, until you get to the desired upper leg measurement. Work straight and do a bit more ribbing. 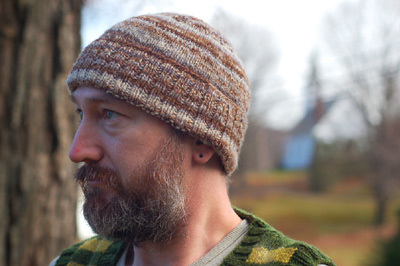 These are knit at a firm gauge and stay up with absolutely no problem. This is my third pair (second made for me) and I’ll keep making them. They’re comfy, super warm, and the colors make me happy. You can’t lose! The little Ravelry logo links are courtesy of Max. Find info here (scroll way down). How lucky is your hubby? Mine is still awaiting a hat and a cardigan while I selfishly continue knitting things for myself. Your husband looks great in your handknits. Re: priest – what’s not to like anyway?? EEK! 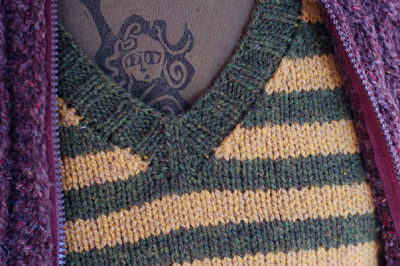 Please tell me how to get that little Ravelry logo in project links. That is so rad. He’s a hell of a funny priest! I was going to say it’d be very easy to make him your friend, but you’ve already discovered this. Mmmm. Legwarmers. I made some last year with silk garden; now I cannot find them. I has a sad. Small world, isn’t it? I bet the spinning priest was happy to know you’re in the neighborhood! Love the legwarmers! I might have to make me some of those – It’s fiercely cold already, and we’ve still got 6 months to go! 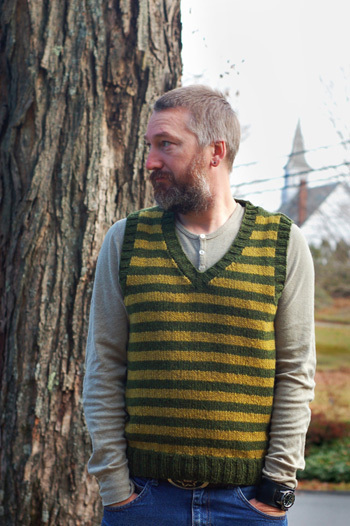 One (selfish) request: I’m loving these steeked vests that you and Jared are busting out lately…I think I get the idea, but would you be willing to give us a quick rundown as far as decreasing for the armholes and neck? Do you just decrease as you would in a normal flat garmet, but next to the steek stitches? everything looks amazing. the vest makes me want to wear one, because they’re not mr.’s style. I love the legwarmer color too. perfect for cheering you up on those grey new england days. I ditto Shaina’s comment about posting a rundown on the vest construction. Woo! Hoo! Good for you!! Wonderful finished objects! I love the leg warmers! I have that fiber in my stash and never saw it spun up let alone knit up. Now I can’t wait to get to it. I’ll have to wait til I’m done my holiday knitting though cause I’m keeping it! 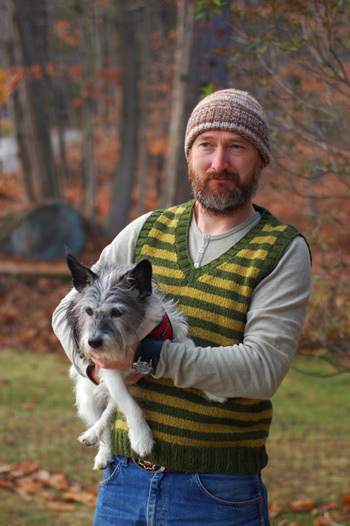 I love the vest/hat photos – classic beautiful knitting! They’re beautiful. Man. Dog. Oh and knitting too! Nice work! 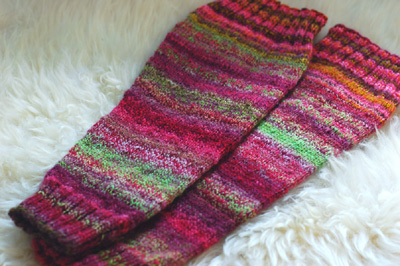 Love the color on the legwarmers, too. Your knitting is beautiful, as is your yarn. I would love the legwarmers pattern to be written-out. I have a couple of questions about your instructions. May I email you and ask? Thanks! I’m loving the FO parade here! Lovely knits, all of them. Much to my husband’s chagrin, you’ve inspired me to knit some legwarmers…I’m always so cold on our walks into campus from the very distant parking lot in which we grad students are allowed to park, and I think legwarmers would be just the thing to help. Lovely things you are making these days and yes, the cold weather does inspire knitting. Very nice work! I love the colors in the vest! I might have to add that one to my dance card. 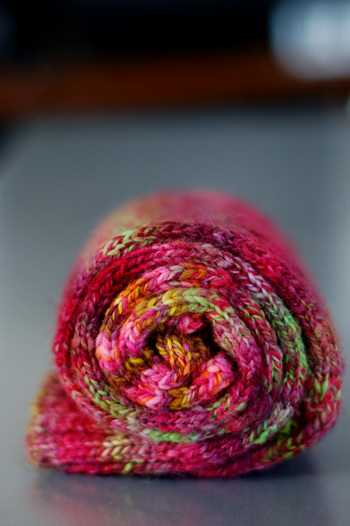 For your leg warmers, when you where spinning the roving, did you Navajo ply? The color progression is lovely! So classic. Ok, the legwarmers may be classic 80’s (in a really good way). the hat is awesome and so is the legwarmers. and it is cold here too. even the saddle shoulder aran i classic elite is a bit on the cold side. i know this thing about we are cold, merete has yarn. and i certainly do. your new place looks perfect and it is wonderful with a minister who spins. did you ever read the history of handknitting by richard rutt. he is a bishop and has written the funniest book about handknitting with a pic of himself in some kaffe fassett goodness on the cover. so much warm woolly goodness! ohhhhh! that vest is glorious! Beautiful vest, I love the selection of colors. And gorgeous handspun, it looks awesome on the hat! Just added leg warmers to my to-knit list! Yours are just lovely, and I can’t wait to cast a pair on; however, must show self restraint and wait until holiday gift knitting is done. Two more gifts, then back to me!